A healthy, properly mowed lawn. 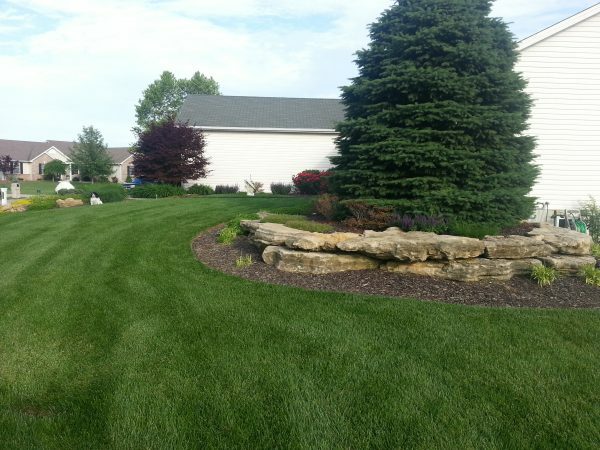 The very least you must do for a home lawn is mow it, and poor mowing is the very first problem that needs to be addressed if you want to give your lawn a chance to be healthy. 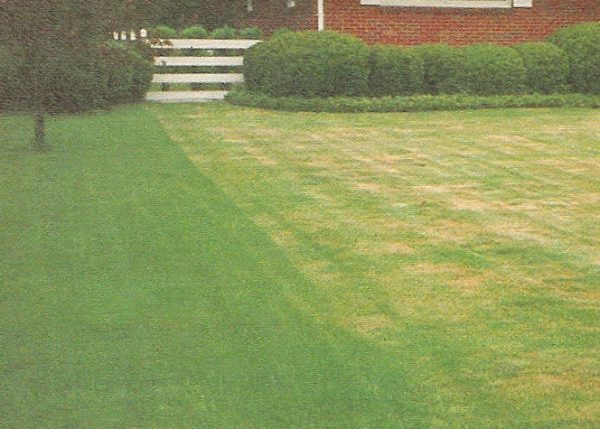 Poor mowing leads to poor color, weeds, crabgrass, disease, thatch, and invasion of undesirable grasses into your lawn. If you are mowing incorrectly, shifting to a proper mowing technique will give you a better looking lawn in a matter of weeks. To understand how to mow a lawn properly, you need an understanding of what is going on with the lawn first–then everything gets easy! The first thing you should know is that grass is a plant that makes its own food in the leaf blades. The importance of that piece of information cannot be overstated, because every time you mow your lawn you are cutting off some of the “food factory” of the grass. Lawn fertilizers like our All-In-One for Lawns, provides some of the raw materials to help plants make their food. When the food factory in the leaf blades is devastated by improper mowing, all plant energy goes towards rebuilding the food factory. Nothing else happens until it is fixed. If your were to scalp the lawn even lower than the height on the left in the picture shown here, there would be little to no root growth at all. 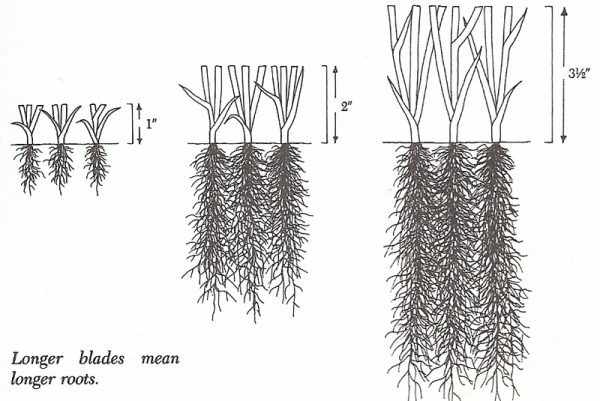 Most plants have somewhat of a balance between above ground growth (shoots) and below ground growth (roots). It may not be entirely equal, but the important point is that the roots and shoots are mutually supportive. The roots send water and raw material to the shoots and the shoots send food and necessary building blocks to help roots expand and do their job. When the blades are cut short and too much of the food factory is removed, the stored food in the roots will be called up to help stimulate new blade growth. Making new leaf blades is the highest priority at this point. Root growth slows down or stops completely till the shoots recover. If this continues too long, all the stored food in the roots will be used up and the roots, no longer being supported by food from above, will wither. This creates a high potential for insect, disease, and weed invasion. With continued scalping, the grass has no chance of surviving. As always, please feel free to drop us a line at info@natureslawn.com if you have any questions about our products or your lawn!